Visit Colombia's wild Pacific coast for untamed jungles and undiscovered beaches. Our insider Chris Bell shares his top tips to experience this once-in-a-lifetime destination. The coastal city of Nuquí is one of the two towns in the Chocó Pacific region with an airport, and is an important gateway to the area for most travelers. There are some basic hotels and restaurants with 24 hour electricity (rare for this region), but most travelers will want to move on soon after their plane lands. The nearby beaches of Pico de Loro and Juan Tornillo offer some of Colombia’s best surfing, although they are recommended for experts only. The community of Coquí, 15 minutes by boat from Nuquí, is home to some of the best-preserved mangrove ecosystems in Colombia. An eco-guide collective offers mangrove tours of 1-3 hours in chingos – traditional hand-carved canoes. This Afro-Colombian community has two basic guesthouses, and hosts a gastronomy festival every January and July, offering a window into regional culture. The most beautiful place to visit is the stunning Guachalito Beach, an hour by boat from Nuquí. This isolated beach fringed with verdant jungle has several guesthouses, as well as some of the best humpback whale-watching (from July to October, when the whales visit the Pacific region to give birth), surfing, and ecotourism in the region. A highlight is El Cantil Ecolodge; beautiful cabins on the edge of the jungle with nature tours and surfing courses. 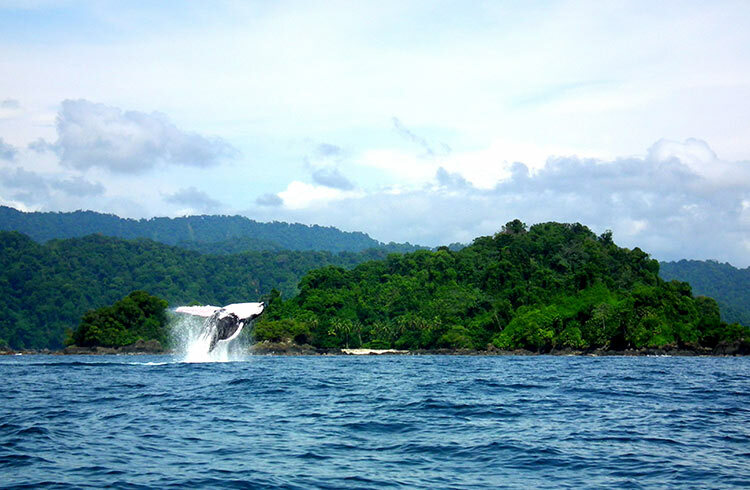 The small neighboring communities of Bahía Solano and El Valle are popular travel destinations in the Pacific region, with some of the most excellent whale-watching. With plenty of places to stay, these towns also cater for a variety of budgets. Hop on a 1-hour boat trip to Utría National Park, the area’s most untouched wilderness. Here, visitors can hike jungle trails, go bird watching, or relax on Playa Blanca, one of the Pacific’s most stunning beaches. Most whale-watching tours include a stop in Utría. You can also organize tours to learn about local culture; El Almejal Ecolodge can arrange for an Afro-Pacific musical group to come and perform traditional music, where guests can also learn about Emberá indigenous culture; including weaving, wood-carving and body painting, from a local family in an authentic maloka (cabin). El Valle’s Almejal beach is also an excellent place for beginner surfers to get some practice. The beachside community of Juanchaco is accessible by boat, just 30min from Buenaventura (3 hours by bus from Cali). Buenaventura is not a particularly desirable place to visit, it’s unsafe and unattractive, but you don’t have to stay long. Just head down to the tourist dock and buy a boat ticket to Juanchaco. From there you can organize return passage to the community of La Plata in Bahía Malaga, where there are also several hotels. With beaches, waterfalls, diving and access to Uramba National Park (one of the best whale-watching sites in Colombia) this is the best option for travelers wanting to experience the Pacific coast without the budget for expensive internal flights. Colombia’s volcanic and seismic activity can cause natural disasters. Find out what to look out for, and which seasons to travel. Dodge these diseases by getting the right vaccinations before you travel to Colombia, plus learn the symptoms of altitude sickness to stay healthy on your Colombian adventures. Colombia’s culture varies from region to region, with unique traditions woven from historical events, geographical positions, and forces of nature. So what are some of the highlights for travelers to explore? I am interested in actually living on the Pacific Coast of Colombia for up to a year. Presently I live in Salamina in the mountains of Caldas. an you recommend the best communities to rent a casa or apartamento for an extended living situation, places not in Buenaventura?